I am truthfully not sure how this didn't make it to the blog sooner as it is one of my oldest, most loved, and most requested appetizers. They are fast, easy, and delicious... all the things appetizers should consist of. I made these for the boys yesterday along with a few other appetizers. Every single one was gone! One (1) bundle of asparagus; washed and trimmed. Wash and trim asparagus to approx 4 inches each. Remove crescent rolls from package and cut each pre-cut roll in half. Remove prosciutto from package and cut each slice in half lengthwise. Take three asparagus spears and tightly wrap with a prosciutto slice. Add a dollop of Boursin cheese to the top of the wrapped bundle. Now, take the widest side of the crescent roll half and place on top of cheese and wrap all the way around so no cheese is exposed. Voila! Cheap, easy, but delicious. I have yet to meet anyone who doesn't love these. To make for a large party, double recipe but only buy one 5.2 oz. package of Boursin cheese. They make for great party food, and the bonus? 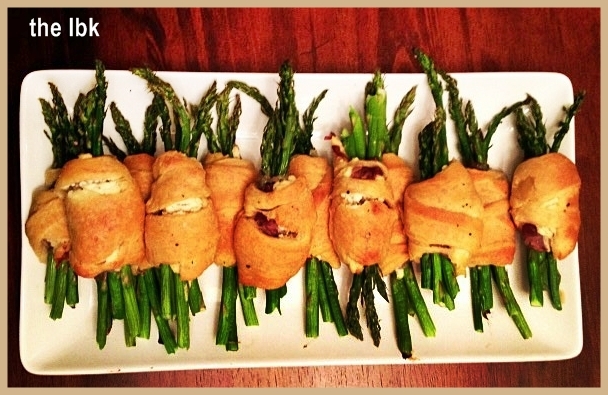 You can assemble them ahead of time and pop them in the oven 20 minutes before your guests arrive! Want to make it vegetarian? Skip the prosciutto! It's still a decadent and delicious treat! You won't even miss it! Stay tuned this week for my "What's on the menu" post for Thanksgiving!